The growing popularity of the tablets evokes some challenges in front of developers to try to catch up with the growing demand for native apps for the large-sized devices. Most of the apps integrated to the Android-running tablets were modified applications for smartphones. However the performance of the apps running on large displays is less satisfying than the programs working on the handsets. 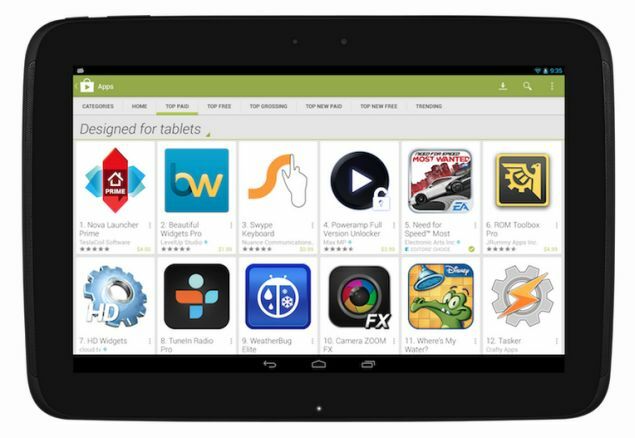 The need for native apps for tablets has evoked Google to focus on finding different ways to improve the situation and to encourage developers to build various tablet-optimized applications. As part of this strategy the company has recently included the “Designed for tablets” section in the Google Play Store. Google was happy to reveal that more than 70 million Android running tablets have been activated worldwide until today. All those devices are working on the platform and need richer library of apps to satisfy users’ needs and expectations. Another change that is purposed to encourage the development and the usage of tablet-friendly apps is the list that Google has added with optimization tips for the apps. Developers will find handy the tablet quality checklist for building of high-quality reliable applications for large-screened devices. The abundance of recourses and tools by Google is improving. The changes in Google Play Store will be introduced soon. More apps will be flooding the tablets’ users for no time.